We live in a culture that breeds fear and drives us to play safe, avoid change, and settle for less than we want or are capable of achieving. Yet when fear runs most rampant, courageous action reaps the greatest rewards. 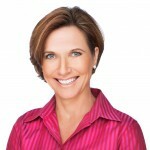 Margie Warrell is a bestselling author, Forbes columnist, keynote speaker, master coach and mother of four. Passionate about empowering people to ‘Think Bigger’ about what is possible for them, her latest book Stop Playing Safe (Wiley) is a guidebook to being more purposeful in what you do, and more powerful in how you do it.